Arsenal midfielder Aaron Ramsey has been replaced as Wales captain by Swansea City defender Ashley Williams. The 28-year-old Williams, who has captained his country four times, will take over for the World Cup qualifiers against Scotland and Croatia. Chris Coleman has not won in four games as Wales boss - including a 6-1 loss in Serbia - and his team have scored once. "I think he has felt the pressure of it," Coleman said of 21-year-old Ramsey. "We need to go in another direction because what we have been doing has not been working. I wanted to make some changes and that was the biggest one really. "It was not an easy decision. Of course he was disappointed. I spoke to him yesterday and he was incredibly mature about it - and a little bit relieved, if I'm honest, because it is a big pressure. "I was very impressed with what he had to say and his reaction. He was very professional." The Caerphilly-born midfielder led Wales 12 times, winning five and losing seven games. But Coleman, who took over in January following Speed's death, has opted to replace Ramsey with the more experienced Williams. Raymond Verheijen, the former Wales assistant manager under Speed, has criticised Coleman's decision to strip Ramsey of the captaincy. "Can't believe today's news: Aaron Ramsey is no longer the captain of Wales," said Verheijen on his twitter account. "Aaron was a great captain in 2011. Extremely mature for his age. "Gary's decision to appoint Aaron as captain was one of the main reasons for our success. Now this part of the legacy has also been destroyed." Arsenal manager Arsene Wenger hopes Coleman's decision will not have a major impact on Ramsey's confidence, the midfielder having come off the bench to score in the midweek Champions League win over Olympiacos. "It is a big decision always to take an armband away from a player," said Wenger, whose side travel to West Ham tomorrow. "Aaron is a bit young with such a responsibility, but on the other hand, it could put maybe too much pressure on him that he is responsible for the big defeat they had in Serbia. "You leave that to his Wales manager, and to have a talk with Aaron. I think he will be a captain again for sure." Swansea City captain Williams will now take over from Ramsey for the rest of Wales' World Cup qualification campaign. 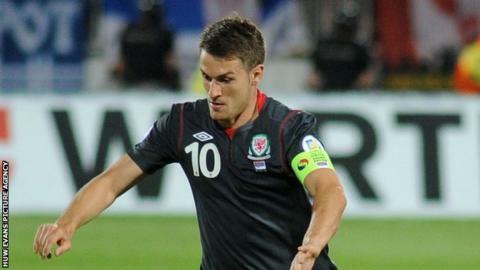 The 36-times capped centre-back will lead Wales in their World Cup qualifier with Scotland in Cardiff on 12 October. "As a captain of your country, everyone wants to do it but not everyone can," added Coleman. "I've no doubt Aaron will be the captain again one day. When I took the job, I was very mindful that whatever Gary had done was working and as much as I possibly could I kept it the same. But now it is not working and I want to go in another direction, which I will do. "Ashley will be the skipper. He is a natural leader. He is a very good player who has great experience." Wales have lost their opening two World Cup qualifiers and host Scotland before visiting Croatia in Osijek on 16 October.